Ridley Scott’s Prometheus is a flawed, visually spectacular and ambitious science fiction epic. Check out my thoughts after the jump. This review is going to contain very little plot synopsis. I purposefully avoided trailers, images etc for this film, and as a result I went in almost blind. It would be somewhat inconsistent if I divulged too much here. I’ve heard from others that the trailers/teasers etc doesn’t give away as much as you might think, so at least that’s something – it’s a pity it was just so damn annoying though. Scientists on earth have found a startling connection between the cave/stone drawings of Earth’s ancient civilizations. They believe all the drawings point to the existence of another planet which humans originate from. 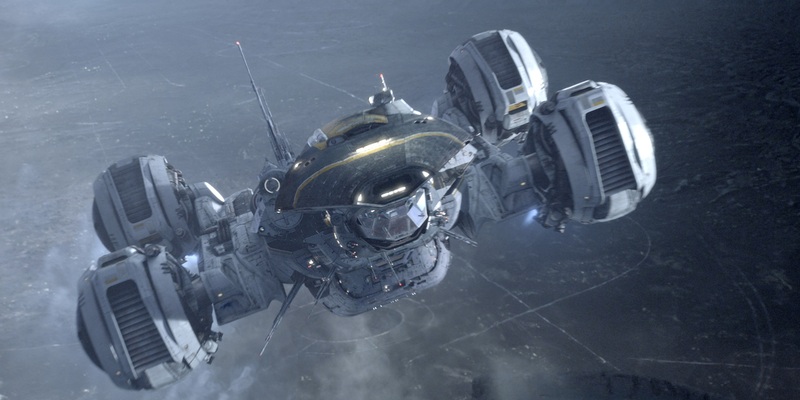 The ship Prometheus sets out with a crew of 17 to find this planet. The crew is made up of scientists, engineers, and those in control of the ship and the mission overall. The film follows the ship and it’s crew on it’s mission into the unexplored corners of the universe. The film is extremely ambitious – both in terms of the themes it covers and in terms of it’s setting and visuals. Those who have seen the Alien films will recognise familiar themes of fertility, biology, life, reproduction, and the very human need to satisfy one’s cursorily. As well as these themes, Prometheus also delves into the age-old questions of, ‘is there a god?’, and ‘where do we come from?’. The desire to understand the origins of life is what drives both the characters and the film. Visually this film is absolutely stunning – it is worth the price of the cinema ticket just to enjoy the visual feast. From the detailed mechanics and workings of the ship itself, to the landscapes, the galaxy, and the life forms that the crew encounters – they have all been created with much skill and care. The detail paid to the biological elements in the film were particularly impressive – to see individual cells and DNA split, and forms change in that way was quite simply incredible. I also found myself being lost in the scenes showing the galaxy and star-scape – they were just so beautiful. Unsurprisingly the 3D added nothing to the film – it really didn’t need it. The only thing it added for me was a headache the next morning. While the film was visually impressive and enjoyable overall, it had some serious issues with the script, pacing, and characters. Aside from Michael Fassbender’s character, I found the characters rather shallow and lacking any real personality. They seemed to be quite two-dimensional, and I found it hard to care too much about what happened to them. Rapace did an okay job, but I found the relationship between her character and fellow scientist Charlie (Logan Marshall-Green) extremely unconvincing. Charlie was such a badly written character, and I found it easy to predict early on where his story was going. Idris Elba seemed to have some fun with his character, although his overally casual attitude to dire situations felt rather put on. In terms of pacing, the percentage of the film’s running time which was allocated to each act was quite badly weighted. While I enjoyed the set-up of the ship and the environment on board, I felt that later events in the film were extremely rushed. The characters were often given very little or no time to reflect on past events – I found this to be quite odd and very cold. I was never bored during the film, so I don’t think it was too long. Overall, it would have worked better if the final act was allocated a larger chunk of the running time, or if the film was 15-20 minutes longer. Despite it’s flaws, Prometheus is a solid science fiction film which is worth seeing on the big-screen. The film has an eerie atmosphere, and you’ll find yourself feeling quite tense at times. Scott has succeeded in creating a visually impressive world which is enjoyable to spend a couple of hours in.